Philippine Airlines (PAL) continues to look for a strategic investor to support turnaround efforts and further international expansion. But so far foreign airlines have been reluctant to invest in PAL as the flag carrier’s position in the highly competitive Southeast Asian market remains challenging and synergies with potential suitors are relatively limited. A new partnership with Etihad will improve PAL’s outlook. But PAL needs more partnerships and ideally a new investor. Meanwhile competition in the Philippine international market is intensifying as PAL aggressively adds capacity in markets that Cebu Pacific is planning to enter. There is a risk of overcapacity as PAL continues to pursue ambitious international expansion. PAL has been transformed since Philippine conglomerate San Miguel took over management of the carrier in Apr-2012. PAL has since embarked on major fleet renewal and international expansion. Domestically PAL has significantly reduced its presence and handed most routes to PAL Express, which San Miguel has converted from an LCC (formerly known as AirPhil Express) into a full-service regional carrier. The surge in international traffic follows growth of only 3% in 2013 to 4.27 million passengers. In 2010 through 2012 PAL’s international traffic was relatively flat. PAL’s market share gain has been even more impressive as the group accounted for 30% of international passengers in the Philippine market in 1Q2014 compared to only 23% in 1Q2013. The overall international market dropped in 1Q2014 by 7% to 4.2 million, according to Philippine CAB data. PAL had captured a 30% share of the Philippine international market back in 2006 and 2007. But its share steadily shrunk from 2008 to 2012. The group captured a 25% share of the Philippine international market in 2012 and 2013. 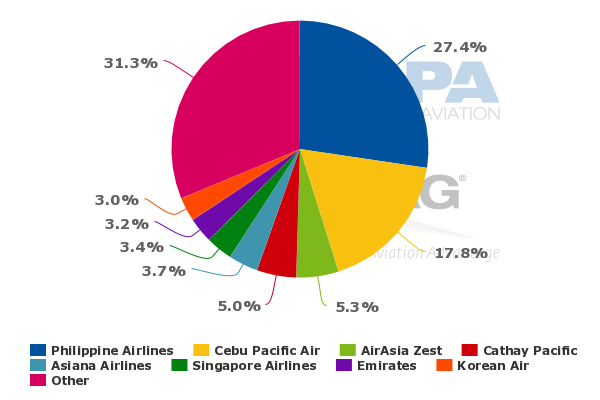 PAL’s domestic market share, however, continues to slip. This is intentional as the group under San Miguel has decided to focus more on the international market and drop the previous two-brand strategy which had budget brand AirPhil operate alongside PAL on domestic trunk routes. The PAL Group captured only 32% of the Philippine domestic market in 1Q2014 compared to 35% in 1Q2013 as PAL mainline traffic dropped 50% to 368,000 passengers. This was only partially offset by a 23% increase to 1.29 million passengers at PAL Express, which has been handed almost all domestic routes, to 1.291 million. The PAL Group’s domestic market share has steadily slipped since 2005, when it captured a 63% share. Cebu Pacific in 2009 overtook the PAL Group as the largest player in the domestic Philippine market. Cebu Pacific captured 56% of the Philippine domestic market in 1Q2014 (includes a 4% share from new subsidiary Tigerair Philippines). Cebu’s international share was 19% in 1Q2014 as its international passenger traffic grew by only about 2% while PAL grew international passenger traffic by more than 20%. PAL’s recent international push should ensure PAL remains the leader in the Philippine international market even as Cebu Pacific starts to expand its new long-haul division and pursues significant growth in Japan. While PAL has been cutting domestic capacity its international network has expanded significantly over the past year with addition of London, four new destinations in the Middle East and two destinations in Australia. PAL is now planning further international expansion in the Australia/New Zealand, North American and European markets. 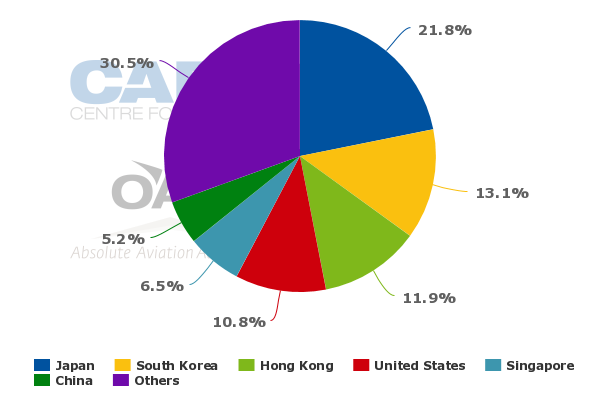 According to OAG data, PAL’s international network currently consists of 34 international destinations, including 24 in Asia-Pacific, five in North America, four in the Middle East and one in Europe. The original plan was for San Miguel or a new strategic investor to take over the LT Group’s remaining stake. Over the past two years Mr Ang has been leading discussions with airlines potentially interested in acquiring a stake in PAL. Mr Ang said in a recent interview with the Wall Street Journal that he is confident a strategic investor will be secured by the end of 2014 but declined to say if the stake would come from the LT Group or San Miguel. Clearly the preference remains for the LT Group to exit. The LT Group’s intent has always been to exit the aviation sector and focus on other investments. San Miguel could potentially take over the stake itself but sees bringing in a strategic investor as an important component of the PAL business plan. Attracting an investor from the airline sector however has so far proven challenging. All Nippon Airways (ANA) emerged as a potential suitor in 2013 as part of the Japanese carrier’s initiative to invest in foreign airlines with a focus on the Southeast Asian market. But ANA has since ruled out an investment in PAL. ANA also has decided not to complete a planned investment in small Myanmar carrier Asian Wings, which when announced in Aug-2013 was seen as a toe in the water with the idea it would be followed by larger investments in the Southeast Asian airline sector. ANA rival Japan Airlines also has been ruled out as a potential investor in PAL. 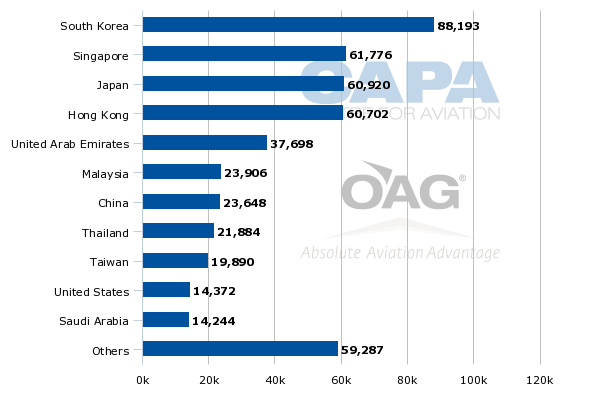 Japan was a logical place for PAL to turn as Japan is PAL’s largest market accounting for about 22% of the carrier’s international seat capacity. PAL currently operates 63 weekly flights to five Japanese destinations (Fukuoka, Nagoya, Osaka, Tokyo Haneda and Tokyo Narita), according to OAG data. But synergies with Japanese carriers are relatively limited. ANA and JAL are strong competitors in the Philippines-US market. PAL is now planning to expand its US operation, which is made possible by Philippine authorities securing a Category 1 rating from the US FAA earlier this year. As PAL expands in North America it will try to woo away passengers that have been flying via North Asian hubs including Tokyo, Hong Kong, Seoul and Taipei, thus increasing the competitive posture towards airlines from those countries. Japan is an important and growing source market for the Philippines tourism sector. But Philippines-Japan is primarily a leisure point to point market and seemingly is not of sufficient importance to Japanese carriers to justify an investment. There are also limited opportunities to offer Japanese passengers connections beyond Manila. South Korea is also an important and growing source market for the Philippines tourism sector. South Korea is PAL’s second largest market based on current seat capacity and is served with 46 weekly flights across five routes (Seoul to Cebu, Kalibo and Manila and Busan to Kalibo and Manila). Korean Air and Asiana each have large presences in the Philippine market which are supported by strong inbound demand from Korea as well as sixth freedom traffic, particularly to North America. Asiana is the second largest foreign carrier in the Philippine market based on seat capacity and currently has 39 weekly flights to the Philippines while KAL is the fourth largest and has 23 weekly flights. But it is similarly hard to build a business case for a Korean carrier to invest in PAL. As is the case with the Japanese carriers, the potential opportunities for Korean carriers to use Manila as a transit hub for other regions of Asia are limited. San Miguel has talked up building Manila into a transit hub. PAL is generally not well positioned for this type of traffic and will need to compromise yields to attract passengers in markets such as Australia-London and Singapore-North America. And potential North Asian partners would be impacted if PAL were to pursue this type of traffic aggressively. While an investment seems unlikely PAL could still use partners in Korea and Japan. A Korean and/or Japanese partner would help with local point of sales and connections to secondary cities in Japan. A Japanese or Korean carrier could also potentially help provide offline coverage to smaller North American markets which PAL does not intend to cover on its own. Currently PAL has a codeshare with only two North Asians carriers, Air Macau and Cathay Pacific. But both partnerships are limited. The Air Macau codeshare is limited to the Manila-Macau route, which is currently only served by PAL (as well as Cebu Pacific). The Cathay codeshare is limited to the Cebu-Hong Kong route, which is only served by Cathay (as well as Cebu Pacific). The Cathay partnership excludes the much larger and more competitive Manila-Hong Kong route or any destinations beyond Hong Kong. The Cathay-PAL partnership is unlikely to be extended as Cathay competes with PAL in several key PAL markets including Philippines-North America, Philippines-Middle East and Philippines-North Asia. Cathay is now the largest foreign carrier in the Philippines with 43 weekly flights and 12,000 one-way seats. Cathay regional subsidiary Dragonair also operates nine weekly flights to the Philippines, giving the Cathay group about 25,000 weekly seats and over 5% of capacity in the Philippines international market. A partnership with a mainland Chinese carrier would be more appealing as PAL only now serves four destinations in mainland China with a combined 22 weekly return flights. But a strong partnership or investment from a Chinese carrier may be made less likely in view of the tense state of relations between China and the Philippines. A partnership with a Taiwanese carrier would be more conceivable but again would likely be relatively limited. Taiwan is a much smaller local market for the Philippines than Hong Kong, Korea or Japan. PAL has only 11 weekly frequencies to Taiwan while China Airlines and EVA Air serve the Philippines with 20 weekly flights and seven weekly flights respectively. The close proximity of Taipei and Manila mean the two hubs compete for traffic and are not synergistic. PAL’s codeshare partnerships in Southeast Asia are also relatively limited. Currently PAL has codeshares with Garuda Indonesia, Malaysia Airlines (MAS) and Vietnam Airlines. Garuda and Vietnam Airlines currently do not serve Manila although Garuda is planning to enter the Jakarta-Manila route by the end of 2014. The MAS codeshare initially provided PAL with offline access to Kuala Lumpur and has been maintained since PAL resumed services to Kuala Lumpur in early 2013. None of these airlines are in position to invest in PAL or any other foreign carrier. A partnership with Singapore Airlines (SIA) would be more intriguing as Singapore is by far the largest Southeast Asian market from the Philippines. There are currently over 60,000 weekly seats between Singapore and the Philippines, making it the Philippines largest market after South Korea. But there would be limited synergies for SIA. PAL is not believed to be on SIA’s list of potential acquisition targets. In recent years most of PAL's codeshare partners have been from the Middle East. PAL currently codeshares with Emirates and Gulf Air, according to OAG data. But PAL also previously codeshared with Etihad and Qatar Airways. Most of its codeshares with Gulf carriers were forged during a period when PAL did not operate any services to the Middle East. In some cases Philippine authorities allowed PAL to have its codeshare partners use PAL traffic rights to Middle East countries, which enabled Gulf carriers to continue expanding in Manila after their own traffic rights were exhausted. PAL forged a partnership agreement with Etihad in late Apr-2014 that builds on the original codeshare between the two carriers. The two carriers announced on 9-Jul-2014 that the new partnership will initially cover the Manila-Abu Dhabi route, which Etihad and PAL both operate. For now the only extension announced beyond the parallel routing is to be on PAL/PAL Express services to 20 Philippine destinations, including holiday destinations such as Cebu, Palawan and Kalibo (a gateway to Boracay Island). Etihad has said it has no intention of acquiring a stake in PAL. While an investment is always a future possibility for any carrier Etihad partners with, PAL has a better chance of finding a suitor within Asia – although even there it faces an uphill battle to secure an investment. PAL recognises the need to work with a Gulf carrier to support its effort to build a more global network. PAL currently does not codeshare with any European carrier. The new Etihad partnership could potentially be extended to destinations beyond Abu Dhabi in continental Europe and Africa as well as secondary destinations in the Middle East. Much of the foundation for Philippine services to the Middle East is in carrying migrant worker traffic, but the Gulf countries in particular have shown increasing interest in holidaying in friendly countries outside the region. PAL has been looking at launching several potential destinations in continental Europe including Amsterdam, Frankfurt, Paris and Rome. One or two European destinations may still be added over the medium term but following the Category 1 upgrade by the US FAA it is more likely to focus on expanding in the US market. As PAL’s only current European destination is London, which is not generally considered a convenient hub for Asia to Europe connections, using Etihad and the Abu Dhabi hub to cover the rest of Europe would be a sensible move. In the US PAL currently serves Los Angeles, San Francisco, Honolulu and Guam. Restoration of Category 1 status has allowed PAL to shift all its Los Angeles and some of its San Francisco flights to the 777-300ER. PAL plans to shift its remaining San Francisco 747-400 flights to the 777-300ER at the beginning of Sep-2014. This will allow PAL to finally retire its 747-400s after an initial plan to retire the fleet in May-2014 had to be postponed. Moving the 777-300ERs to the US market improves PAL’s product and efficiency but comes with a catch as PAL has to transition its Vancouver and Toronto services from 777-300ERs to A340s to free up 777s for the US market. PAL currently serves Los Angeles with 11 weekly frequencies, San Francisco with seven weekly frequencies, Guam with five weekly frequencies and Honolulu with three weekly frequencies. Vancouver is served with seven weekly frequencies, three of which continue onto Toronto. PAL has been looking at launching new destinations in the US in late 2014 or 2015. Chicago and New York are the most likely candidates. PAL is also planning to increase Guam and Honolulu to daily services from late Oct-2014. PAL uses A320s to Guam and A340s to Hawaii. The increases in these markets come ahead of Cebu Pacific’s planned launch of services to the US, which is also made possible by the Philippines regaining a Category 1 ranking. Cebu Pacific aims to launch Guam by the end of 2014 using its A320 fleet and begin serving Hawaii in 2015 using its A330-300s. Category 1 also enables Philippine carriers to codeshare with US carriers. A codeshare partnership with a US carrier would improve PAL’s position in the US market as PAL would gain offline access to domestic destinations. But PAL could find it challenging to attract a US major and may have to settle for a codeshare or interline with a smaller carriers such as Alaska Airlines, JetBlue and Virgin America. Partnering with a top European carrier may also be challenging although this may not be as critical if its able to expand its new partnership with Etihad. In addition to potentially providing offline access to Europe via Abu Dhabi, the Etihad partnership could lead to partnerships with European carriers that are part of the Etihad equity alliance such as Alitalia and airberlin. PAL would also find partnership with an Australian carrier valuable, although options are few. PAL is pursuing significant expansion in Australia. PAL currently operates four weekly A340 flights to Sydney, three weekly A340 flights to Melbourne and three A320 flights to Darwin, with continuing service to Brisbane. PAL plans to upgrade Sydney to daily in late Oct-2014. At about the same time PAL reportedly is intending to upgrade Melbourne to daily and begin non-stop flights to Brisbane and Perth. PAL briefly served Perth in 2013 with four weekly flights via Darwin but quickly dropped the route while maintaining Manila-Darwin-Brisbane. The Australia expansion comes just as Cebu Pacific enters the Philippines-Australia market. Cebu Pacific plans to initially operate four weekly flights to Sydney from Sep-2014 and is looking at adding Melbourne in 2015. While Cebu Pacific should be able to stimulate new demand, overcapacity is likely if PAL implements its plan to double capacity to Australia. Overcapacity is also likely in the Hawaii and Guam markets as both PAL and Cebu Pacific expand. Overcapacity has already resulted in the Philippines-UAE market after both PAL and Cebu Pacific entered the market in 2H2014. Both carriers have also been pursuing significant expansion to Japan. The prospect of overcapacity and irrational competition results in a relatively gloomy short to medium term outlook for the Philippine international market. The inevitable discounting has the potential to stimulate new business but there is no indication just how the market would respond to lower prices. PAL has come a long way over the last two years as the carrier has renewed its fleet and rebuilt a global network. But the expansion has come at a cost. PAL incurred a net loss of nearly USD300 million for the year ending 31-Mar-2014. Mr Ang has expressed confidence that PAL will be profitable in 2014, pointing out the carrier was in the black in Apr-2014 and May-2014. But April and May are traditionally two of the strongest months for Philippine carriers. It will be challenging for PAL to remain in the black for the full year. PAL's aggressive international expansion coupled with international expansion at Cebu Pacific provides a difficult landscape which will inevitably pressure yields and load factors. Many strategic pieces to the puzzle remain elusive. PAL needs more partnerships to help support its expanded online network and efforts to build a more global offline network. While the Etihad partnership is a step in the right direction, it is only a start. Even more critically, as it seeks to expand its global reach, PAL needs one or more strategic partners which would provide network benefits as well as the capital required for further expansion. San Miguel is banking heavily on being successful in this mission. But the field of potential suitors is small and so far foreign airlines have shown few signs of making a move.